I felt like I could have put more thought into this, but honestly, I just wanted something neutral so I could wear colorful jewelry. I don’t think my necklaces were big enough. Making a note to buy more impact statement pieces in the future. Oh and I got my bangs trimmed today for free at Lot 8 Salon since I had my haircut there before. Totally worth it, they offer you a beverage and Christine Dao, the owner, is a sweetheart of a lady. Plus, the art decor and general atmosphere is pretty killer and hipster friendly. I have a lot of those questionable tanks, the could-be-dresses-but-definitely-aren’t kind. I wanted to play with hemlines and see how short I could go to pull off the tank as a dress. I wish I had more cardigans though, the solid purple hitting the solid grey bothers me a bit because I like breaking up textures/colors/prints. I’ll need to work on this look because it seems a little childish to me, but I’m working with what I can. My first day back at Rice was great! I decided to start off by breaking a few fashion rules. Usually, navy and brown are not worn with black and Fitted tried to explain to me that it was because the colors blend in too much. Also, shorts and heels aren’t that great looking to me, especially formal shorts because how does that even make sense. So I decided to put this outfit together to show that they can. When all three are worn together, the colors blend with each other and fit a similar palette beautifully. It’s a very simple outfit, but I like its underlying complexity. My roommate Jenny-Babe took this picture and I like how my legs look miles long, because they’re not. I’ve been enjoying not going to my nonjob too much for the past day and a half. So today I went out to the mall and tried to get back to dressing myself. I even put on some make up, a bit of green shadow and some sparklely blue mascara, both on only the bottom lash. I apologize for the poor lighting, I just ran into Macy’s dressing rooms for this. I also ran into Lindzello and we talked for a bit but she was working so I had to stop bothering her. This room, of course, does not do the outfit justice. It looks better in real life and in motion; it flutters about when I walk. today was a small heart crystal stud and a dangling one that is actually a converted charm bracelet. I bought this charm bracelet and the individual charms ages ago, thinking I would collect them over time. That never happened and this sat on my shelf for years. I’m glad I found a way to rework it and am pretty pleased with the results. The clear jewel bead has a cat sitting on top of it. The Chinese characters are Love, left, and Fortune, right. However, now that I’ve taken Chinese, it does bother me that the charms are in simplified characters instead of traditional, esp. Love. The traditional Love character had the “heart” radical in it and the simplified doesn’t. As Stephen-san says, it’s like taking the heart out of love, which is totally communist. Colorado-based Crocs Inc. stock has lost 90 percent of its value since last October, and the company predicts its shoe sales in the U.S. will decline by 20 percent this year. Yeah you keep telling yourself that Croc execs. Whatever makes you happy. I highly suggest you listen to the segment, because if you are a croc hater and croc watching is what you can’t help but feel is your form of public service, then it’s very satisfying. I was literally giggling like a mad person, with the fingers wiggling and “MAHAHAHHAHAHAA’s” to no one in particular. Is it wrong that I am genuinely delighted to hear about the possible downfall of a company? Is it? Because I don’t feel a thing. 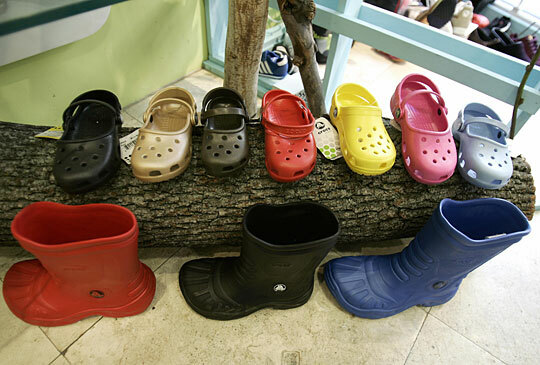 Well maybe the fact that the economy is poor and gas prices are atrocious and the dollar is weak and I despair at the thought of not being able to buy more things I don’t need overseas and all that hullabaloo BUT at least I can see a silver lining as Crocs are slowly being put to the death. So huzzah!